Welcome to Green Gardens Landscape & Installation, Inc.
Green Gardens Landscape & Installation, Inc. is a female-owned landscape company committed to quality customer service and sustainable landscape practices both in maintenance and landscape design choices. 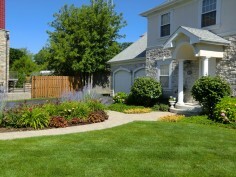 What can Green Gardens Landscape & Installation, Inc. do for you? 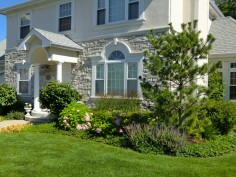 Provide full service landscape maintenance or customized year-round landscape maintenance plans. Create a pleasing outdoor environment with seasonal color through installation of plants and planters throughout the front and back yards. Resolve or reduce storm water drainage issues by creating rain gardens, installing drainage and use of native plants, where appropriate. What does Green Gardens Landscape & Installation, Inc.’s commitment to sustainable landscape practices mean to you? We strive to incorporate sustainable or ‘green’ maintenance and design practices that conserve water, improve general health of existing materials and recycle yard waste into organic matter, whenever possible. Our goal is to partner with our customers so the landscape is in harmony with the natural environment, your space and your budget. What sustainable or green landscaping practices does Green Gardens Landscape & Installation, Inc. provide? Full service maintenance programs: spring clean up that omits conventional weed control, increase nitrogen levels with grass clippings, hand pruning shrubs/trees and mulching of fall leaves to spread on turf and plant beds. Landscape designs that incorporate native plants, rain gardens and focus on creating a calming environment. Drainage and storm water management solutions to manage storm water run-off. Core aeration and seeding to maintain turf health. Compost or mulch applications that contain a higher organic content to add nutrients back into soil. Snow removal and environmentally safe salting for plants and animals. 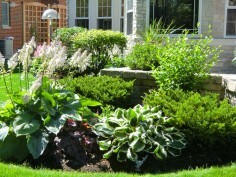 "Green Gardens Landscaping is a unique company with both owner and workers who are knowledgeable about and committed to using sustainable techniques in design, installation and maintenance. This is unusual and a very valuable asset for customers. Besides this, they offer the best customer service in the business. You will be amazed at how fabulous your property looks and how easy they are to work with". "Great work, nice people, good price. What's not to like? For the past two-plus years, Lindy Westerfeld’s Green Gardens Landscape & Installation has done a great job of taking care of our landscaping needs. We love gardening, but often seem to get too busy with other things just when the yard needs some more attention. With Green Gardens Landscape we have peace of mind knowing that our property will look good....We can always tell when she’s been by to spruce up the yard: everything looks sharper, even the bed lines. In all my experience of dealing with lawn design/maintenance crews, working with Green Gardens Landscape has been the most gratifying on many levels. I tend to be a perfectionist and Lindy's Green Gardens Landscape allows this in me and meets my expectations time and time again. I can’t say enough for the enhancements ... suggested for my property while working within my budget. Green Gardens is incredibly responsive to e-mails, phone calls….and is very much visible on my property surveying the work being done, observing the health of my grass, flowers, bushes, trees and being vigilant for problems ....The team... bring so much knowledge to their business….they get an A+ from me for all they do. 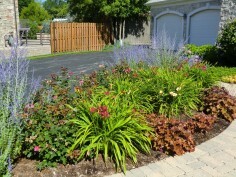 "Green Gardens Landscape did a great job in helping to alleviate stormwater and drainage problems around our house. She explained the concept of a French drain which we had Green Gardens Landscape install in both front and back yards. They have been very effective." 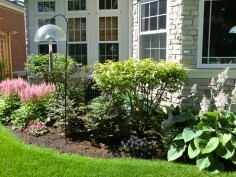 "We have been very pleased with the spring and fall clean-ups Green Gardens has done. (In particular) Lindy consults with us beforehand as to what tasks will be done. She oversees the job and her workers are very efficient." "Green Gardens did a great job on the landscaping and design. We now have an awesome yard ...that is dog friendly ... with 3 dogs it is quite a challenge. Everything is gorgeous, everything is lush. Not only do we have a great time playing with the dogs; we have great contemplative areas to enjoy viewing the plantings. It is so relaxing!" When undertaking a landscape project, found Lindy listens; offers suggestions ("Did you think about? ); merges customer's ideas with appropriate suggestions. Results are beautiful and "always include color." - Installation crew is great!